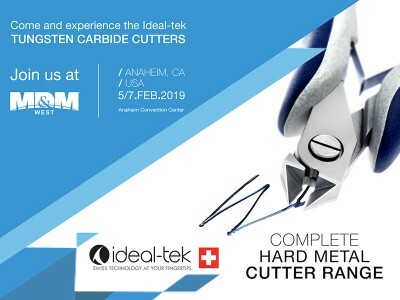 Ideal-tek Tungsten Carbide Cutters @ MD&M West 2019// February 5/7. Ideal-tek Swiss Made Tungsten Carbide Cutters with Ergonomic Handles, are specially designed for cutting hard metals. Hard wire cutters can be used on single or multiple filars and for lateral or internal cuts. To experience Ideal-tek Tungsten Carbide Tools in person, please meet us at MD&M West 2019, booth 3075B, from 5th to 7th February and discover our products first-hand. Check TUNGSTEN COMPLETE RANGE LEAFLET to find out more.